Bailiffs perform essential duties in a courtroom, as they ensure everything proceeds in an orderly fashion. The Bureau of Labor Statistics reports that there are more than 16,240 of these professionals nationwide working at the state, local or federal level. New courts are constantly being opened up in order to relieve the backlog in others, which means demand for this position is likely to grow in the near future. Many colleges that offer degrees in criminal justice also have programs related to law. Legal students sometimes put on mock trials as a part of their academic requirements. If you could secure a spot as a bailiff during one of these mock trials, you could get a feel for the type of work you might be doing once you find employment in this field. If your college requires an internship, try to perform your duties alongside an actual courtroom bailiff or a sheriff’s deputy who is responsible for transporting inmates to and from court. Doing so will give you more practical hands-on experience, while also helping you connect with people who make the hiring decisions for bailiffs in your area. 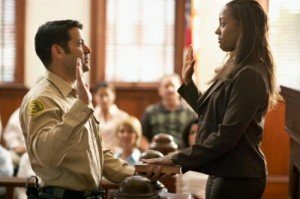 In some cases, it can be helpful to obtain related experience before becoming a courtroom bailiff. Many bailiffs with the U.S. Court System obtained experience by working as a court clerk, docket manager or sheriff’s deputy first. Consider applying for one of these positions in order to gain some practical experience that can give you a leg up on the competition later. Your degree in criminal justice or corrections will be helpful to you in obtaining one of these positions as well. Once you are hired as a bailiff, you will work under the direction of a more seasoned courtroom deputy for a period of time in order to get a feel for how things operate. At first, you will likely just shadow that individual, but after a week or so, you will perform your duties while he or she watches. In all, an on-the-job training program will probably last anywhere from two to four weeks. Although there are no continuing education or licensing requirements associated with being a bailiff, you could nonetheless be required to participate in ongoing training every year. This training could consist of learning how new security detection equipment works or refresher courses in equal opportunity or sexual harassment prevention. A career as a bailiff is rewarding and exciting, because it puts you at the center of dramatic legal action on a daily basis. As a bailiff, you’ll play an important role in the administration of our justice system, and it all begins with the right degree program.